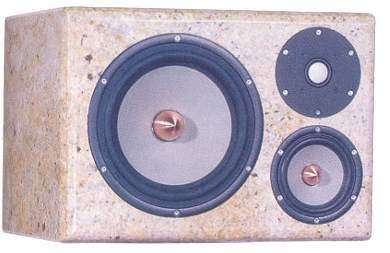 Since a bass reflex solution providing low bass would have resulted in a large speaker Bernd Timmermanns decided to use a sealed cabinet with a capacitor in series to the W22 EX 001 bass driver, called GHP design (geschlossene Bauweise mit Hochpass; or in English: sealed cabinet with high pass). Further information regarding this design you can find on our theory pages. The speaker may be placed on a sideboard, shelf or speaker stand. ... "The listening test exceeded all our expectations. Above a fat and tight bass that was by no means too voluminous but amazingly low, this Excel trio placed a layer of fascinatingly clear and detailed mids and high frequencies. Demanding vocals were the favourite meal of the Bookshelf BS1. Seldom have we experienced Olga Borodina in Stravinsky's Le Sacre Du Printemps (Berlin Philharmonics, Philips) so realistically and three-dimensional. The entire recording of "Le Sacre" was reproduced with an incredible richness, with extraordinary imaging and ease by these masterful speakers. But the BS1 is by no means just for classical music. Even pop and jazz are sound great. Again we had to trouble the Manger CD: the O-Zone Percussion Group's performance was almost explosive matching even the best speakers around. The extremely wide percussion range sparkled with an exceptional resolution and clarity, with adequate punch but never with harshness. Especially the magnesium dome tweeter at it's first appearance has to be given the attribute 'world-class', at least when the bandpass filter is combating the resonance." Please note: the 0.033 mH coil is already finished, since unwinding of a 0.1 mH coil, as described in Hobby HiFi, might lead to wrong inductance values during production. Please note: the 0.033 mH coil is already finished, since unwinding might lead to wrong inductance values during production. - 82 uF Mundorf MCAP foil capacitor. - 15 uF Mundorf MCAP foil capacitor.